Nearly every system on today’s cars have an electrical component. These days, virtually every system on your car or light truck is controlled electrically… even systems that have traditionally been mechanically or hydraulically controlled. The throttle and steering? They’re starting to use drive by wire. Brakes? Most have antilock braking systems. Engine and transmission? Do you really need to ask? So the one thing you need to expect from your repair shop is a clear understanding and familiarity with electricity and electrical system diagnosis and repair. Because, without that, today’s technicians will be lost in a maze of wiring and schematics. That’s okay, because the technicians at your local Cottman center are electrical wizards. They’re familiar with electrical system diagnosis, from the principles of electricity to in-depth diagnostic strategy and repair. They know how to isolate electrical system problems and how to fix them… fast. Just as important, they know how to recognize when a problem isn’t electrically based, because those systems still have mechanical and hydraulic components that can wear and fail. And they can pinpoint and repair those problems, no matter which part of the system they’re on. 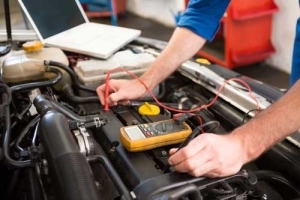 So, if your car has a problem in one of its many electrical systems — or even if it’s in a related mechanical system — bring it to your nearby Cottman center for a thorough diagnosis. They’ll root out the problem and make sure you never pay a dime more than necessary to get it back on the road and running right.